Most of us get our introduction into the iron game with a simple home workout routine. As a kid I spent countless hours down in my parents basement after school working out with an old plastic cement filled York Barbell and Dumbbell set that my dad had. I can remember thinking to myself “if I do this everyday until the end of the school year I’ll be as big as Arnold in the Conan movies”. Well obviously, things didn’t quite turn out as I had planned, but this is where I got my start into working out. In this article I’m going to outline a solid total body workout routine that you can do at home on a shoestring budget. All you’ll need is a set of adjustable dumbbells and the desire to train hard. Your success lies not in how much equipment you have available, but in how much effort you put into your workouts and desire to succeed. This home workout is divided into 2 days. You’ll work half your body during one workout, and the other half during the next workout. After you have done both workouts you’ll take the following day off from working out before repeating the routine. This way you’ll work each bodypart twice per week. For the first workout you’ll be working your; chest, shoulders, and arms. For the second workout you’ll be working your; back, legs, and abdominals. To work more of the upper chest you can do your push ups with your feet elevated on a bench as shown here. Note: it is normal for your reps to decrease a lot with each set as your muscles get tired. For example, you may get 15 reps on the first set, 10 reps on the second set, and then only 5 reps on the last set. Each workout strive to perform at least 1 more rep on each set. This exercise works the entire deltoid area and the triceps. Secondary stress is placed on the upper chest and upper back muscles. Grab 2 dumbbells and clean them to your shoulders. The palms of your hands should be facing forwards during the exercise. Keep your feet shoulder width apart. 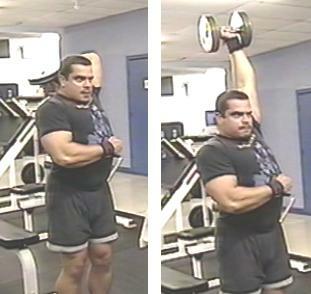 Keeping your elbows directly under the dumbbells press them upwards until they are at arms length above your head. Lower the dumbbells back to the starting position. Repeat. 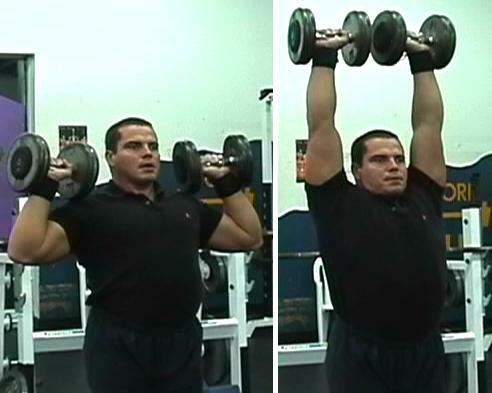 This exercise is excellent for working the traps. Secondary stress is placed on the forearms from gripping the weights. Hold the dumbbells at your sides. Stand upright with your feet shoulder width apart. Keep your arms straight during the entire movement. Sag your shoulders downward as far as you can. You will feel your traps stretch, hold this position for a second. 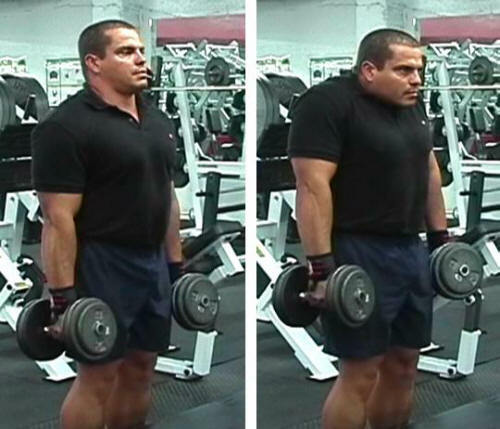 Then shrug your shoulders upward and squeeze your traps at the top. Hold this position for a second. Repeat. This exercise is a basic movement that works the biceps and forearms. Grab a pair of dumbbells. Stand with your feet shoulder width apart. Let the dumbbells hang at arms length on each side of your body. Keep your elbows close to your torso at all times. Moving only your forearms, use your bicep strength to curl the dumbbells up to shoulder level. Rotate your hands so that your palms are facing upwards at the top. Hold this position for a second to maximize the peak contraction in the biceps. Slowly lower the dumbbells to the starting position. Repeat. Tips - do not lift excess weight and use momentum to swing the dumbbells up. Use a lighter weight and keep the movement slow and controlled. For variety you can do this exercise with one arm at a time. This exercise works the triceps, particularly the long inner head of the triceps. Grab a dumbbell with one hand. Stand with your feet shoulder width apart. Lift the dumbbell so that it is at arms length straight above you shoulder. Keep a slight bend in your knees to take pressure off the lower back. Lower the dumbbell in an arc motion behind your head until your elbow is at a 90-degree angle. 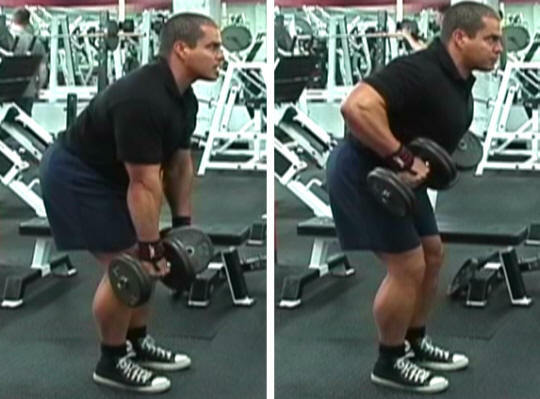 Lift the dumbbell in an arc motion back to the starting position. Repeat for the desired number of reps. Do the same for the other arm. 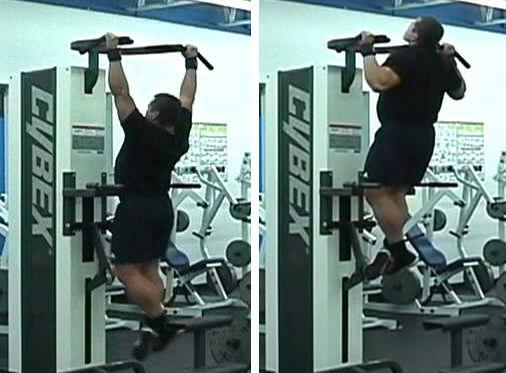 Pull ups work the lats, rear deltoids, biceps, and forearms. This is more of an advanced exercise because you have to be able to lift your entire bodyweight. Grab the pull up bar with your hands a bit wider then shoulder width apart. Bend your legs so that your body is hanging from the bar. Straighten your arms and let your lats stretch. Hold this position for a second. Arch your back slightly and pull yourself up to the bar until your chin is over the bar. Hold this position for a second to maximize the peak contraction. Slowly lower yourself to the starting position. Repeat. If you can’t perform a full pull up with your bodyweight, stand on a chair or stool and use your legs to “jump” up to the top position and then do negative reps by slowly lowering your body down to the bottom. By doing negative reps you’ll still work the muscles and gradually build up enough strength to be able to perform a full range of motion pull up. Tips - you can vary your grip to work your back from different angles. (i.e. wide grip, narrow grip, overhand, underhand, etc.). This is a basic back exercise that works the latissimus dorsi, trapezius, erector spinae, biceps, and the forearms. Grab a pair of dumbbells and bend over at the waist with your hands placed shoulder width apart. Keep a slight bend in the knees and keep your upper body at a 45-degree angle to the floor and arch your back. Moving just your arms row the dumbbells into your stomach. Hold this position and squeeze your back muscles for a second to maximize the peak contraction. Lower the dumbbells until your arms are straight. Repeat. This movement is great for working the quads, hamstrings, and glutes. This exercise also works many smaller stabilizer muscles because it requires a lot of balance. Step out about a couple feet with one leg, keep your toes pointed forward and your front foot flat on the floor. Bend your front leg until your knee is at a 90-degree angle, your back should also bend until it is at a 90-degree angle. Push up and return to the starting position. 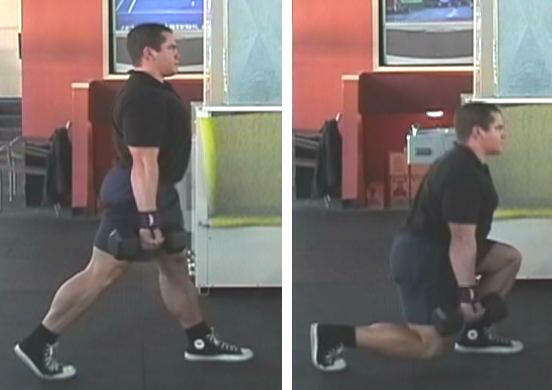 Repeat for the desired number of reps, then do the same with the other leg out front. 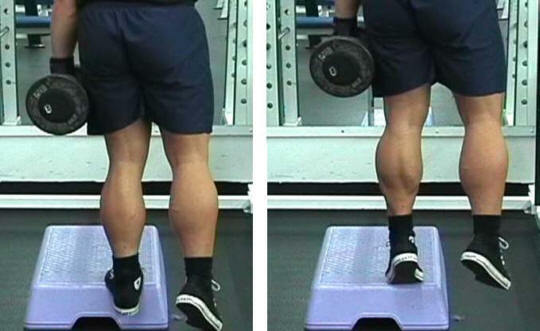 This is a good calf exercise for developing balance and proportion between both calfs. Hold a dumbbell in one hand at your side. Step onto the ledge of a sturdy platform (at least 6 inches high) with the balls of both feet. With your free hand, grasp a fixed support bar for balance. Keep your chest up, abs tight and your eyes focused forward. Keep your working leg (dumbbell side) straight as you keep your nonworking leg off the floor. Concentrate on maintaining perfect balance, keeping the dumbbell steady at your side. Slowly lower your heel toward the floor until it can go no farther; hold briefly, feeling a good stretch in the calf. Without bouncing, forcefully press through the ball of your foot to drive your body up as high as possible. Hold the peak contraction for a second before lowering your heel and repeating. Once you complete all reps for one leg, repeat with the other leg. This exercise works the frontal abdominals, especially the lower half of the abdominal muscles and the hip flexors. Lie down on the floor with your legs out straight. Place your hands under your bottom to help balance yourself. Use your abdominal strength to lift your legs in an arc motion until they are pointing straight up. Slowly lower your legs back to the starting position. Repeat. Do not let your feet touch the floor in between reps, keep the tension on the abdominal muscles at all times. This basic abdominal exercise isolates the upper half of the fontal abdominal wall. Lie on your back on the floor. Your feet should be flat on the floor shoulder width apart with your knees bent at a 90-degree angle. Place your hands behind your head for support. Without pulling on your neck, slowly lift your shoulders off the floor using your abdominal strength. Breath out as you contract your abs. Hold this position for a couple of seconds to maximize the peak contraction in the abs. Then slowly lower yourself to the starting position. Lee Hayward's Total Fitness Bodybuilding 3 Disc DVD Training System is jam-packed with the most powerful techniques for pushing your overall muscular development to a whole new level. Take your workouts to a higher-level and accelerate your progress in the gym. Become bigger, stronger, and more muscular without frustration and actually enjoying the process along the way. Learn the ideal number of sets & reps to do for each exercise you perform. As well as a simple formula for determining exactly how much weight to lift for each and every exercise. Step-by-step instructions on how to perform all of your exercises with proper technique. Learn the most common errors that people make with each exercise and how to avoid them.